The Merfett – Page 2 – Everybody. Be. Cool. A few weeks ago I had an essay published on Her View From Home, which is a lovely site! I’m so grateful they accepted my work. If you’d like to read it, you can find the essay here. I was sitting on the couch earlier this week, completely spent from a series of hard days. It was 7:00pm and I had put the kids to bed early. Lately, everything with the toddler has been a revolving script of “NO” and “WHY.” I settled into the couch with my dinner at my side, reaching for the remote to scroll through my recorded shows. My phone chimed with a text from a new Mama friend. We chatted for a moment and I felt myself smile. She suggested an activity for us to do the next morning and I happily agreed. I needed something to pull us out of this funk that had taken up residence in the threenager. Last week was my 31st birthday. Yay. My husband was out of town working, and I was flying solo with kids and dogs and life. I’m not big on MY birthday, but I love celebrating. Anything that brings people together is a win in my eyes. A group of friends I’m affectionally starting to call my “Mom-Gang” offered to take me out to brunch after our favorite Barre3 workout. Brunch is my love language. Brunch with friends at a restaurant is next-level to me. We had just seated and settled when I hear my name over my shoulder. I turn, as I’m shoving puffs into the hands of my toddler, and I see a new Mom I’ve met that recently moved to town from Seattle. We exchange some small talk, she introduces her husband who’s with her, and they wish me a happy birthday. I turn back to my table-mates and they look at me wide-eyed – how long have you lived here? how do you know so many people? I shrug and laugh, as I rip open a bag of fruit snacks for my seemingly still-famished child. In the Fall I joined MOPS. I was a healthy mix of nerves and excitement at our first meeting. I met all the ladies at my table and we exchanged contact information. After the meeting we all parted ways and I remembered that night we had dinner plans with my sister-in-law to attend the grand-opening of her friend’s new restaurant, a chicken and waffle place, and they were offering free waffles for dinner. I pulled out my phone and plugged the info in my MOPS group text, thinking all moms want a free meal their kids will eat that they don’t have to cook, right? I hit send, and never hear a word back. Later that evening our family is gathered around a corner booth with our tribe of kids, cutting waffles and managing syrup use – when I hear my name. I turn around to see a MOPS mom and her family finishing their meal, thanking me for telling them about dinner. 15 minuets later another mom from MOPS comes through the door – her husband is out of town, and she’s so relieved to not have to cook another meal. As we’re finishing our dinner the youngest mom of our group arrives with her husband and 3 month old baby. They slide into the booth next to ours with a shy smile and a nod. I wave and thank them for coming. My sister-in-law is laughing and completely flabbergasted, you guys have lived here what, like 2 months, how do YOU know more people in here than ME?! I smile and shake my head, equally surprised. I was loading the dishwasher the other night, collecting the last of the kid’s plastic cafeteria style plates to rinse. I suddenly felt so thankful and happy. It hit me in a massive wave, right as I scraped mac n’ cheese into the sink. I like it here. I’m happy. I have friends. It’s working. Last night I told my husband that I haven’t met a single person here that I haven’t liked. From the grocery store cashiers to the preschool teachers to the random fellow sleep-deprived Mom in the Target – I haven’t walked away from a single interaction with anyone, with anything less than positivity. I got an email last night from a friend that moved to town with her family at the exact same time we did. Just about 8 months ago. She paid me the sweetest compliment and said how thankful she is that we met. And it made my heart burst. I’m equally thankful for having her in my life. I’m just brimming with gratitude. For everything. Not all day, every second of the day, but it’s the overarching theme in my life right now. And I have my town to thank for that. All this magic, and these people and the friendships. It’s not me. It’s bigger than me. Thank you, Flagstaff. A few weeks ago I wrestled the Christmas decoration boxes down from their newfound perch in our storage shed. It was a crisp and clear fall day. The sky was a brilliant blue, the air chilly but the sun was warm. It took me three trips back and forth into the house to get everything inside. Lastly, our artificial tree still in its original box from purchase. After several seasons the tree sort of haphazardly resided in the box – mostly stuffed in askew, contained in large part due to the odd cable my husband had wrapped around it to create a carrying handle. We purchased that tree the year we got married. We had a gift card and a 20% coupon to the almighty Bed Bath & Beyond. It was pre-lit with white twinkly lights and had various pine cones and sticks glued onto the branches. In a word, it was ugly. But we were thrilled. As newlyweds we had very little expendable income, and we walked out of the store that night with our tree and a box of plastic multicolored ornaments for $12. We excitedly drove home, our shoppers-high in full effect from getting such a steal of a deal. We immediately assembled and decorated the tree, our first as husband and wife. Once adorned the tree transformed. It was no longer wispy and sparse. The tree proudly glowed from its perch in our small living room, and all at once our home felt warm and cozy and magical. As we admired our work I told my husband I wanted to start a new tradition. 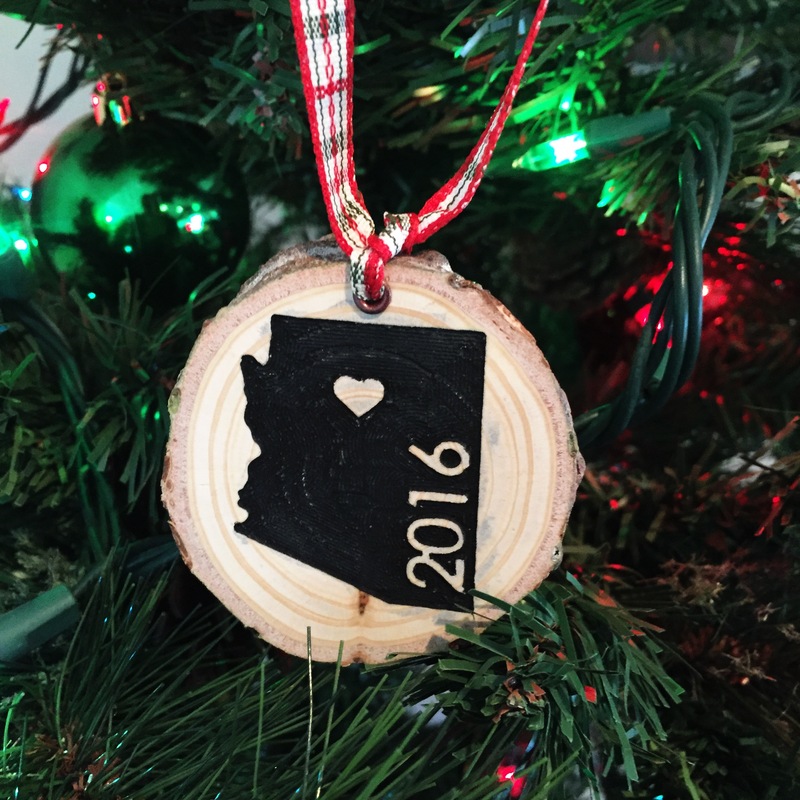 Each Christmas I wanted to add a new keepsake ornament to our little tree. Something to commemorate the year, that we could build over our time as our family grew. That year it would be a simple handmade circle, etched with The Murphy Family 2012 – Our First Christmas as Mr. & Mrs.
On Christmas Day that year, we told our families that we were pregnant with our first Son. I immediately viewed the Nativity and Mary in a brand new light. Christmas would never be the same once having children. Nothing is ever the same, truthfully. And each year we’ve added a new unique ornament to our bargain tree. A First Christmas for each of our Sons. And this year, a new memory to mark in time. This will be our first Christmas in our new home. In our new town. In our new state. A year ago this was a dream. 2 years ago it was a conversation. 3 years ago it wasn’t even a thought. How did we get here? I’m often asked, why did you come here? What made you choose Flagstaff? And after almost 6 months I still don’t have it wrapped into a cute little answer – but most of the time I reply, we just wanted to do it. It’s with wide eyes starting back at me that I elaborate – We wanted more and less of everything at the same time.